Although there is not enough information, we know that José was 17 when he travels from Spain to Italy, with the aim of following the footprints of Caravaggio. He first goes through the north of the country to continuo to Rome, where he meets the Dutch caravagists living there. Finally, he settles in Naples, where he thinks that he is going to get more work. There he begins with his work as a printmaker and he quickly becomes famous in all Europe. Meanwhile, influenced by Caravaggio’s work, he devotes himself to painting; and he is soon nicknamed “lo spagnoletto”, which is “the little Spanish” in Italian, in reference to his short height. Although de Ribera always clarified that he was Spanish, many times signs his works as Giuseppe or Jusepe, Italianization of his name. His first stage is acknowledged by the harsh contrast between light and darkness, typical of the tenebrists. But little by little, he slowly softens his palette without compromising the quality of the drawing. The motifs are generally religious, and he portraits saints or scenes from the bible. However, he also paints myths and profane figure such as Archimedes, one of the biggest mathematicians in history. In the painting, we see the portrait of the scientist, although not the way we are used to: the serious and deified image of the portraits and sculptures are a product of classicist ideals of the 19th century. Instead in the Portrait of Archimedes, we see a common person, more like a beggar than a mathematician. His smile allows us to see his wrinkled face and his dirty teeth, while if we look at his hands, one with a compass and the other holding a book, we notice the bony fingers and dirt under his nails. In the book he is holding, we can see mathematical diagrams and the spine of the book at the left is signed by the artist as “Jusepe de Ribera, Spanish”. The intention of the painter, here, is not to present a heroic and virtuous image of the scientist. But, on the contrary, he prefers to show him as a kind, common person. 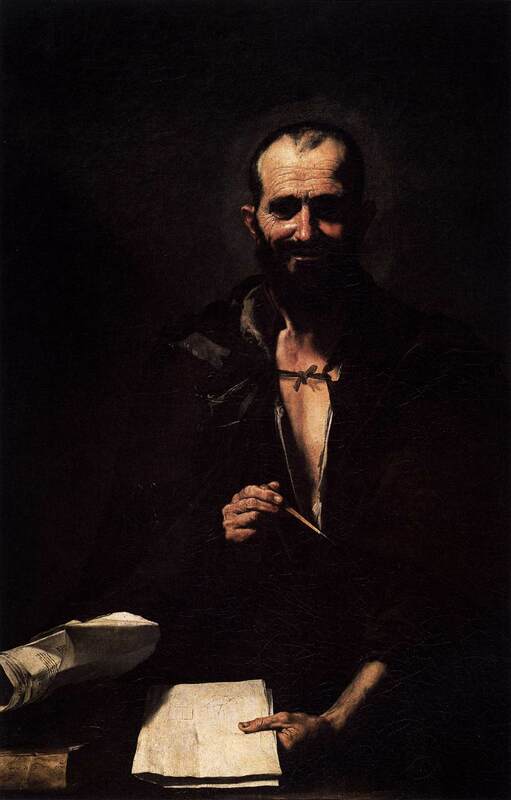 Ribera, instead taking Archimedes to the realm of the gods, chooses to dignify his human characteristics. ~ by Álvaro Mazzino on September 28, 2010. It is actually a great and useful piece of info. I am satisfied that you just shared this useful information with us. I’d like to end this day the way I began it: with my illusions intact. Oh, yes, and here’s all that Chanel loveliness that happened a few days ago. If you’re so inclined, you can shop vintage and pre-owned Chanel via Portero. This entry was posted on September 28, 2010 at 10:33 and is filed under Baroque.You can follow any responses to this entry through the RSS 2.0 feed.You can leave a response, or trackback from your own site.